Samuel Adams (September 27, 1722 – October 2, 1803) was an American leader, politician, writer, political philosopher and one of the Founding Fathers of the United States. Adams was the chief Massachusetts leader of the patriot cause leading to the American Revolution. Organizer of protests leading up to and including the Boston Tea Party, he was most influential as the writer and theorist who articulated the principles of republicanism that shaped the American political culture. He used his writing to influence others, and make a case for withdrawing from Great Britain and forming a new representative government that would allow for self-governance and the civil rights of it citizens. 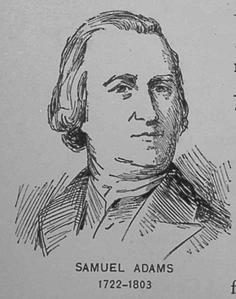 Adams was born in Boston to Mary Fifield and Samuel Adams, Sr., Samuel was their tenth child. President John Adams was one of his cousins. Adams was a baptized member of Old South Church in Boston, and from the tower of the congregation's Meeting House made the loud war cries signaling the beginning of the Boston Tea Party. Adams attended Boston Latin School. He received a bachelor and master degrees from Harvard University. Prophetically, the subject of his master's thesis was "Whether it be lawful to resist the supreme magistrate if the commonwealth cannot otherwise be preserved." In 1748, with the death of his father, and mother not long afterward, Adams inherited the family brewery and a sizable estate. Within ten years, he had spent and mismanaged most of it to the point where creditors attempted to seize his home. By 1760, Adams was bankrupt and working as a local tax collector. Turning his attention to politics, Adams wrote political essays to the Independent Advertiser newspaper and joined a political club, the Whipping Post Club, as well as Boston's South End Caucus, which was a powerful force in the selection of candidates for elective office. Being a tax collector in Boston, he used non-collection of taxes as a political bargaining chip. By 1765, he was a leader in Boston's town meetings, drafting protests against the Stamp Act that protested British efforts to tax the colonists and called for a spirited defense of Americans' "invaluable Rights & Liberties." Over the next decade he became an increasingly dominant leader of the town meeting. He repeatedly insisted on the "inherent and unalienable rights" of the people, a theme that became a core element of republicanism. While a member of the legislature, Adams served as clerk of the house, in which he was responsible for drafting written protests of various British governmental acts. Notable among these was a circular letter he drafted as a response to the 1767 Townshend Acts, distributed among the other twelve colonies in a bid to achieve a united front of resistance to these acts. The failure of the legislature to rescind the contents of this letter at the express demand of King George III was one of the main factors resulting in the stationing of troops in Boston beginning in 1768. The British troop presence in Boston, aggravated by protest activities such as Adams' formation of the Non-Importation Association, led to the Boston Massacre (a term coined by Adams) two years later. After the incident Adams chaired a town meeting which formed a petition, presented to acting governor Thomas Hutchinson, demanding the removal of two British regiments from Boston proper. Hutchinson at first claimed no responsibility for the matter, owing to his temporary status as governor, but stated he would be willing to move one regiment; the meeting was reconvened and Adams successfully urged the crowd of more than five thousand present to stand firm on the terms: "Both regiments or none!" Fearing open warfare, Hutchinson had both regiments removed to Castle William, an old fort on an island in Boston Harbor. These regiments would thereafter be known in the British Parliament as "The Sam Adams Regiments." In 1772, after a British declaration that judges should be paid by the crown rather than by the colonial legislatures, a demand from the people of Boston for a special session of the legislature to reconsider this matter was refused by Hutchinson. It was at this point Adams devised a system of Committees of Correspondence which was a committee that recorded the British activities, where the towns of Massachusetts would consult with each other concerning political matters via messages. Such a scheme was still technically legal under British law, but led to a de facto colonial legislative body. 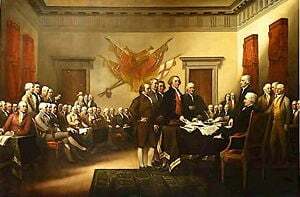 This system was adopted by each of the Thirteen Colonies, creating the Continental Congress. 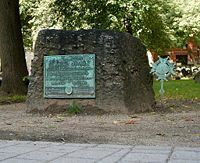 Adams is best remembered for helping organize the Boston Tea Party of December 16, 1773, in response to the Tea Act—a tax law passed in London that allowed the British East India Company to land tea free from the tax that had been imposed on it earlier. The angry reaction from all the colonies was to expedite the opening of a Continental Congress, and when the Massachusetts legislature met in Salem on June 17, 1774, Adams locked the doors and made a motion for the formation of a colonial delegation to attend the Congress. A loyalist member, faking illness, was excused from the assembly and immediately went to the governor, who issued a writ for the legislature's dissolution; however, when the legislator returned to find a locked door, he could do nothing. Adams was one of the major proponents of the Suffolk Resolves, drafted in response to the Intolerable Acts, and adopted in September 1774. Whose "spirited" resolves called for disobedience to the Coercive Acts, endorsed military preparations for defense, and called for the meeting of an extralegal provincial congress. Adams opposed a compromise offered by Joseph Galloway and advocated boycotts of British imports through the continental associations. In September 1774 Adams retired from the legislature and was a delegate to the Continental Congress in Philadelphia. He was one of the first and loudest voices for independence (notably, only he and John Hancock were exempted from the general amnesty offered by Thomas Gage to Massachusetts rebels in 1775). He was a workhorse member of the Second Continental Congress, serving on numerous committees, notably the Board of War, from May 1775 until 1781. The climax of his career came when he signed the Declaration of Independence in 1776. After that, Adams, wary of a strong central government, was instrumental in the development and adoption of the loose government embodied in the Articles of Confederation, to which he was also a signatory in 1777. Like others in his party, Adams had both a suspicion and dislike of both General George Washington and the American army itself, often saying, "The sins of America will be punished by a standing army." He continued serving in the Congress until 1781, when he was elected to the state senate of Massachusetts. He served in that body until 1788, becoming its president. At the time of the drafting of the United States Constitution, Adams was considered an anti-federalist, but more moderate than others of that political stripe. His contemporaries nicknamed him "the last Puritan" for his views; in 1788 he would write in his diary regarding the federalist and anti-federalist factions, "Neither Interest, I fear, display that Sobriety of Manners, Temperance, or Frugality—among other manly Virtues—which once were the Glory and Strength of our Christian Sparta on the Bay...." He finally came in on the side of ratification, with the stipulation that a Bill of Rights be added. Additionally, Adams was a member of the conventions that drafted the first Massachusetts state constitution in 1779, and the second one in 1788. He stood unsuccessfully for election to the House of Representatives for the first Congress, but was elected lieutenant governor of Massachusetts, serving from 1789–1794. He was elected as governor in 1793 to succeed John Hancock, and served to 1797, afterward retiring to his home in Boston. In old age, Samuel suffered from symptoms akin to those of cerebral palsy or Parkinson's disease, so Samuel's daughter Hannah had to sign his name for him. 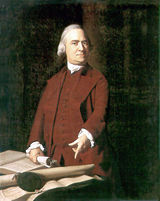 In addition to his daughter Hannah, Adams had a son named Samuel Adams, Jr., by his first wife, Elizabeth Checkley (1725-1757), whom he married in 1749. She died three days after the birth of their last child, a stillborn. He and his second wife, Elizabeth Wells, whom he married in 1764, did not have any children. His son, Samuel Adams, Jr., studied medicine under Doctor Joseph Warren, fellow patriot and friend to both Adams and his second cousin John Adams. Samuel Adams, Jr. held an appointment as surgeon in Washington's army. He died in 1788. His government claims provided enough for Adams and his wife to live on in their old age. Adams died at the age of 81 in 1803 and was interred at the Granary Burying Ground in Boston. Owing to his occupation as a brewer, today a popular brand of Boston beer bears his name: Sam Adams. "If ye love wealth greater than liberty, the tranquility of servitude greater than the animating contest for freedom, go home from us in peace. We seek not your counsel, nor your arms. Crouch down and lick the hand that feeds you; May your chains set lightly upon you, and may posterity forget that ye were our countrymen." —Speech delivered at the State House in Philadelphia on August 1, 1776. "If ever time should come, when vain and aspiring men shall possess the highest seats in Government, our country will stand in need of its experienced patriots to prevent its ruin." —Samuel Adams, attributed. This page was last modified on 17 August 2015, at 22:20.